Michelle at Angel Albums shared a beautiful quote from a very well known and popular Robert Munch book in honour of Pregnancy and Infant Loss Remembrance Day. 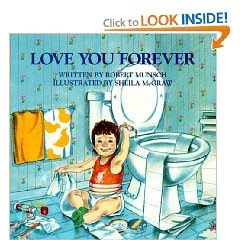 What struck me the most is the fact that "Love You Forever" started out as a song that Robert Munsch wrote about two of his babies that were born still? He said that he wrote it just for them and he would cry whenever he tried to sing it. I had no idea. We have read this book to our boys several times, given it to friends and family as gifts and never did I realize the origin of it. Oh I love that. Thank you so much for sharing! When Lukas was here, E bought the book because a co-worker told him about it. He would read it to him. When Lukas passed, we used that very same quote in his video. And on every angelversary, we read this book to Lukas. Now every shower that I have gone to, I have given this book as part of the gift. It will certainly mean even more now. Wow, I had no idea that Munsch has been through infant loss. Whenever I read or share the book, it will give me a whole new meaning as well. Thanks so much for sharing this info. I can definitely see how that fits. I never really cared for that 3rd line. Even if I'm not living, they'll still be my babies. we bought this book before my son was born and have read it a million times to him and Ella(she loved to be read to!).. I had no idea about that.. how special.. thank you for sharing..
Wow, that's so interesting to know the true origin of the book. I can't believe you posted that this week, because I just bought that book the other day, and had to hand it to my husband to finish reading it to our son, because I broke down crying! That was before I knew the original intent of the author. It really is a beautiful book, and we all laughed and laughed together at the picture of the Mommy rocking her huge, grown-up son. what a beautiful quote, thank you so much for sharing. I had never heard of the book, but will look for it in the future. I did not know the origin nor did I know it was a song. I will have to go listen to is now. thanks for sharing! Update on "Little Miss Sunshine"